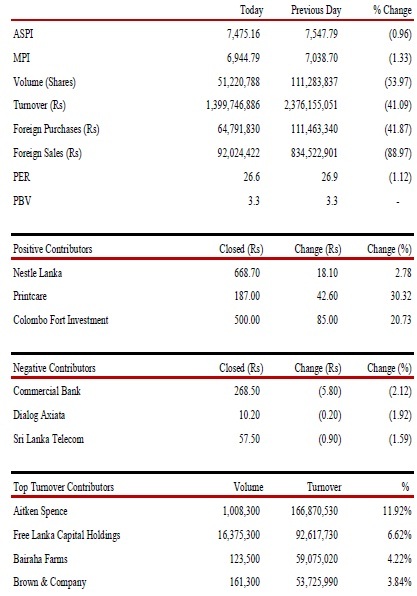 Colombo Stock Indices took a downturn amidst selling pressure creeping in on Tuesday the 19 April 2011. Profit taking was witnessed in the stocks which made gains in previous few weeks. Turnover also remained relatively low. The All Share Price Index (ASPI) closed at 7,475.16 points, dipped 0.96% by 72.63 points and the Milanka Price Index (MPI) dropped 1.33% by 93.91 points closing below 7,000 points at 6,944.79 point during the day. Total turnover was at Rs.1.39 billion (fell 41.09%) with a total 51.22 million volume of shares changing hands (fell 53.97%). .Foreign purchases dropped 41.87% to Rs. 64.79 million and foreign sales also fell 88.97% Rs.92.02 million. Price to forward Earning Ratio (PER) depreciated by 1.12% to 26.6 times. Several crossings recorded including 80,000 of Bairaha Farms (BFL) at Rs.480 per share and 1.75 million of John Keells Hotels (KHL) at Rs.17.60 per share. The Diversified sector was the main contributor to the market turnover due to Aitken Spence (SPEN) and Free Lanka Capital Holdings (FLCH) with the sector index decreasing 0.81%. Aitken Spence (SPEN) was the main contributor to the market turnover with a crossing of 1,000,000 shares at Rs.165.50. The share price decreased by Rs.0.40 (0.24%) and closed at Rs.165. The Bank, Finance & Insurance sector was the second main contributor to the market turnover , sector index decreased by 1.27% mainly due to Central Finance (CFIN). Blue chip stocks continued to decline amidst dull foreign participation. Profit taking was witnessed in Bairaha Farms (BFL), and Brown & Company (BRWN). Renewed interest was witnessed in illiquid stocks such as Printcare (CARE) and Arpico Finance (ARPI).